I went to Vilnius in January to confirm that everything was in order for the April conference, and prepare the final programme with Milda Alisauskiene and Donatas Glodenis. Although the situation was slightly better in the following days, I was greeted by a 29° Celsius (-22° Farenheit) temperature the first day. Everybody told me that this is very unusual and in fact never happened before. Historians disagree: it happened, precisely 190 years ago, in December 1812 and January 1813, when Napoleon had the idea to take his troops retiring from Russia to Vilnius. It was a bad idea. They expected better weather, were simply not equipped for 29°, and between 30,000 and 40,000 French soldiers died, in fact the beginning of the end for the Grande Armée. I tried two of the four daily flights to/from Vilnius: Frankfurt and Amsterdam (there are Berlin and London Gatwick, too). Lufthansa serves Vilnius with a regular medium-sized plane, whilst the plane serving Amsterdam is a small commuter. I would rather recommend Frankfurt (which, at least from Italy, is also less expensive). As I did before, I stayed at the Radisson SAS, a very new hotel in an historical building, probably the best in town. Its highly recommended, but expensive. Another, slightly less priced, hotel for those loving historical places is the Narutis. Most Eastern European participants are expected to stay at the Baltpark Hotel. Hotels in general are not cheap in Lithuania. The country is up to the average European standards, and very clean: you can check out the different bed and breakfast possibilities in our hotels page for a budget accommodation. The good news is that, when Winter is so bad, Spring is usually wonderful, or so everybody says. Lithuania is very proud of being a truly European country (actually, the geographical center of Europe is located not far from Vilnius). It has been independent for most of its history (in part, within a kingdom also including Poland), and sees the Czarist Russian (1795-1918), Soviet (1939-1941 and 1944-1991) and Nazi (1941-1944) occupations as parenthetical. Lithuania was also the last country in Europe to formally convert from a native ethnic religion to Christianity, in 1386, when the Lituanian Grand Duke married the Catholic Polish Queen creating a monarchical union. Another thing many Lithuanians are proud of is to represent the center of Roman Catholicism in Northern Europe. The Catholic Church had a key role in the national resistance to the Soviet occupation. The Ostra Brama icon of the Virgin Mary, in the Gates of Dawn in Old Vilnius, is the symbolic center of Lithuanian Catholicism and attracts thousands of pilgrims (some of them actually Eastern Orthodox). Those staying the Sunday after the conference in Vilnius may see an important pilgrimage there on Palm Sunday. The old city of Vilnius, in general, has been included by the UNESCO in its list of internationally protected cultural sites. There are several religious minorities, and there will be papers about some of them in the conference. Two worth noting are the Karaites and the members of local ethnic or traditional religions (they do not particularly like the label pagans, and reject neo-pagans  if anything, they claim to be old pagan). The Karaites broke away from mainstream Judaism in eight-century Babylonia. They are a Bible only (or, rather, a Torah-only) movement, which rejects rabbinical interpretation of the Torah as embodied in the Talmud. The historical capital of the Lithuanian Karaites is the beautiful city of Trakai, where we will go on our Saturday afternoon field trip. Besides the Karaites, Lithuania was of course noted for its mainline Jewish culture. 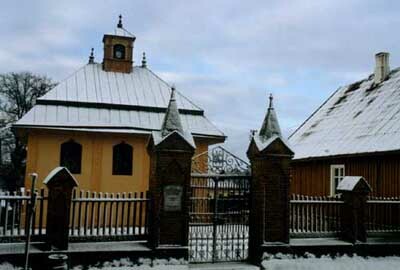 Until World War II Vilnius was known as the Jerusalem of the North, and Elijah ben Solomon Zalman (1720-1797), the Gaon of Vilnius, was probably the most famous Talmudic and Kabbalistic scholar of the 18th century. The Nazis, however, destroyed 104 of the 105 Vilnius synagogues, and killed or deported 90% of Lithuanian Jews. Many survivors fled to Israel or the United States. As a result, there is not much left to see about the Jerusalem of the North, although the National Gaon of Vilnius Jewish Museum is worth a visit. Concerning the ethnic-traditional religious groups in Lithuania, we plan a short field trip on Friday evening to attend a rite of fire organized by Romuva. Those who attended the New Religious Movements group meetings at the 2002 American Academy of Religion conference in Toronto know about this group through Mike Strmiskas paper. Others will have an opportunity to check out for themselves in Vilnius. I visited Jonas Trinkunas, the group leader, in Vilnius and he showed to me a video of their ceremonies (where I also recognized the familiar face of Michael York!). Rituals seem very interesting, although we would very much prefer to avoid rain. Jonas Trinkunas assured me that the gods always take care that no rain disturb their rituals, so we should be pretty much safe. See you in Vilnius in April!